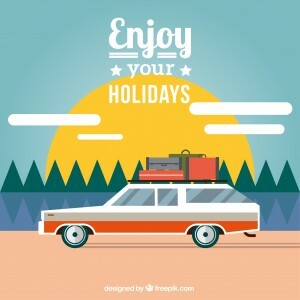 It’s that time again…time to travel and visit with family and friends over the school holiday. It’s time to think of ways to keep the kids comfortable and occupied during long trips. It’s time to prepare for the “just in case situation” which always seem to occur when we travel, such as motion sickness. If you’re going by car, plan a travel route with stops where your children can get out of the car and run around and blow off some steam from being cooped up in the car. Good places are parks and child play areas. Get to where you are staying overnight early, before the kids get overtired, hungry and cranky. Pack some hand sanitizer as it’s a good alternative for hand washing if soap and water aren’t available at a toilet rest stop. Try to make your meal stops a little before the usual lunch or dinner rush hour – you’ll get better service and it won’t take quite so long. Paper towels or wipes can be used in lots of ways. Take a change of clothes for each child. Depending on the season, you might also want to take hats or something warm to put on. Some families take an old ice cream container for accidents of any kind. It can also work as a potty if your child hasn’t been toilet trained for long and there are no toilets around. If you have a child who wets the bed, take a piece of plastic to protect mattresses. Take some healthy food, such as fruit, to snack on. Bring water to drink, and try to avoid too many soft drinks. Small plastic water bottles with pop-tops can be very good for young children. Traveling on a bus or train can be very exciting for young children. But long trips can pose similar challenges to long car trips, as children can become bored with the scenery and of being stuck in a confined space. So, be sure to bring food, drink, toys and books as you would for car travel. If you’re going overseas, check with your doctor in advance so you can all get the vaccinations you need. Dress children lightly for air travel, and check that you can get blankets from the cabin staff if needed. Layers of clothes that you can take on and off are a good idea. Some airlines are better at supporting parents traveling with children. It can be helpful to ask other parents about which airlines they preferred to fly with. If you’re able to organize the timing so your trip back home happens during night time, you’re more likely not to disturb your children’s sleep pattern. If you have a toddler, it can be handy to take a fold-up stroller for him to sit in at airports. If you’re traveling with a baby you can ask to have a bulkhead seat, which gives you more leg room and a place for a bassinet. There may already be a bassinet in the bulkhead, but check with the airline when booking – you might have to bring your own, and a size and weight limit applies. Bassinets also offer a place for your baby to sit while you have your meal, or when you just want a break from holding him or her. When the airline staff ask at the start of your flight if you’ll need any help, tell them you’ll need a hand to heat bottles and/or solids, and that you might need help at meal times so you can eat. Pack a comfort or cuddle toy your child likes for the plane trip. Small toys – such as little dolls, cars, trucks and trains – are good for playing on the tray top. Some children are more prone to travel sickness than others. Before leaving, don’t eat fatty foods, but do eat something – it seems worse on an empty stomach. Encourage those with travel sickness to look outside the vehicle, not inside. They shouldn’t look at moving things, like other cars – instead, they should try to look at something that’s still, such as the same spot on the horizon. Make sure there’s a breeze and fresh air – it’s a good idea to have the window open a little bit. Don’t read in a moving vehicle. Some people find that keeping their head as still as possible can help. Try to distract travel sick children by getting them to think about other things. If your child goes pale, gets very quiet or complains of feeling sick, stop and let her have a walk in the fresh air. If your children are often sick, take a container, wipes, a towel and a change of clothes in case of accidents.